LAST 8 AVAILABLE IN UK and EUROPE! Get yours before they are gone for ever! 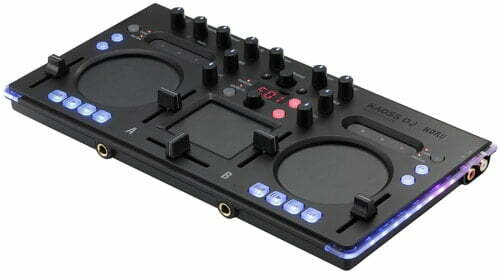 The Korg Kaoss DJ Controller is an ingenious take on a traditional DJ controller. While many low-cost options often lack a great deal of functionality, particularly regarding FX, Korg have made this the focus point of the Kaoss DJ. The controls on the unit are lit by LED making them easier to pick out in a dark, club environment and it also comes with Serato DJ Intro software. This is a great introduction to the world of Serato, which is one of the most popular and professionally used pieces of DJ software in the world. The jog wheels that we’ve come to expect from these types of units are nowhere to be found and instead are replaced with touch platters. These are sensitive and although they may take a bit of getting used to – they’re good fun once you get your eye in. Plus, it’s a nice change to play around on something that has a bit of a different feel to it. 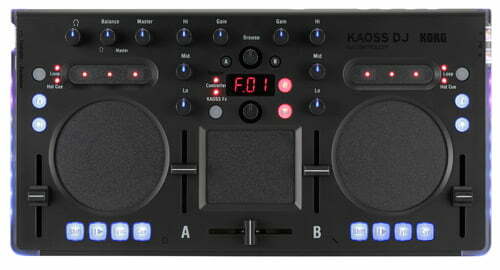 Between the two touch platters, lies the Kaoss DJ’s most intriguing feature – the Kaoss pad itself. 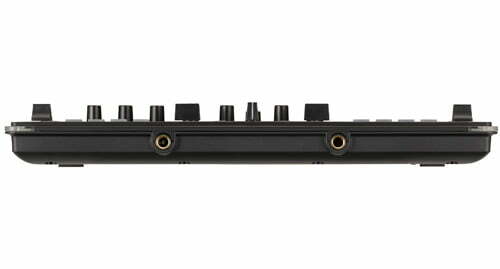 This is a high-quality effects unit which allows you to manipulate the tracks that are running either separately or over the master, an attractive feature for a controller within this price range. It’s worth mentioning about the Korg Kaoss DJ Controller that even a great deal of professional level DJ equipment wouldn’t generally have such a plethora of effect capabilities as this machine. This is a massive selling point for the Korg model. Along with this; the effects themselves are wide ranging and responsive: A big step up from other DJ controllers in this price range! For someone looking to pick up a fairly low-budget controller, the Kaoss DJ has a lot to offer you. It’s very different to its competitors. This is mostly due to the unique jog wheels and built in effects but don’t let that put you off. We can just about guarantee that even more experienced DJ’s will have a great time coming to terms with these changes and really pushing the Kaoss DJ as far as it can go. KAOSS DJ is extremely compact while maintaining all the functionality DJs command–and more! Serato DJ Intro software is supported (Free download), so you can connect the KAOSS DJ to your PC and get maximum DJ performance with the minimum equipment. KORG’s unique KAOSS PAD DJ effect unit offers 120 programs which are ideal for DJ performances, as well as synth programs inherited from KORG’s Kaossilator. Simply moving your finger on the touch pad lets you control effects in complex ways. FX RELEASE function automatically adds a delay when you take your finger off the touch pad; naturally blending the effect into your sound. Hold function maintains the effect even after you release your finger. Auto BPM function automatically detects the BPM of the song and synchronizes the effect. Scale/Key settings let you play a synthesizer in the key of your song without any wrong notes. The KAOSS DJ is sleek and streamlined; with high-visibility LEDs providing constant feedback to the user. At a mere 730 grams, it’s ready to go anywhere your laptop is. Despite its compact size, KAOSS DJ is loaded with powerful features that are all laid out to be friendly and fast. At the heart of the KAOSS DJ is a great-feeling crossfader and two highly-responsive touch platters. Large level meters are placed on both sides of the body and provides excellent visual feedback; while adding an eye-catching additional live element your performances. All of this, along with cueing, looping, sync, and powerful KAOSS effects, make the Korg Kaoss DJ Controller a professional-level DJ controller that’s built to perform. KAOSS DJ isn’t just a DJ controller and effects processor. 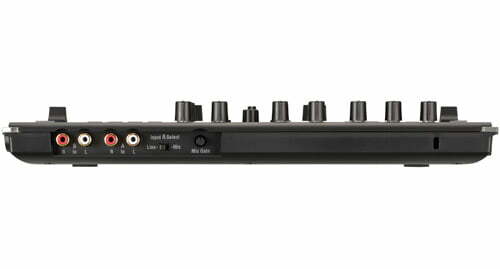 Also, it features a USB audio interface with inputs and outputs; thus providing even more performance possibilities. With audio, MIDI and effects features; KAOSS DJ is a complete DJ solution! * Windows users need to install KORG 4ch ASIO driver. * Mac users need to install the latest KORG USB-MIDI Driver. The KAOSS DJ can also be used as a stand-alone, functioning as a two-channel mixer; so audio sources can be connected away from the computer and can be affected by the KAOSS effects. You can choose which set of inputs are processed; or set them all to run through the effects.